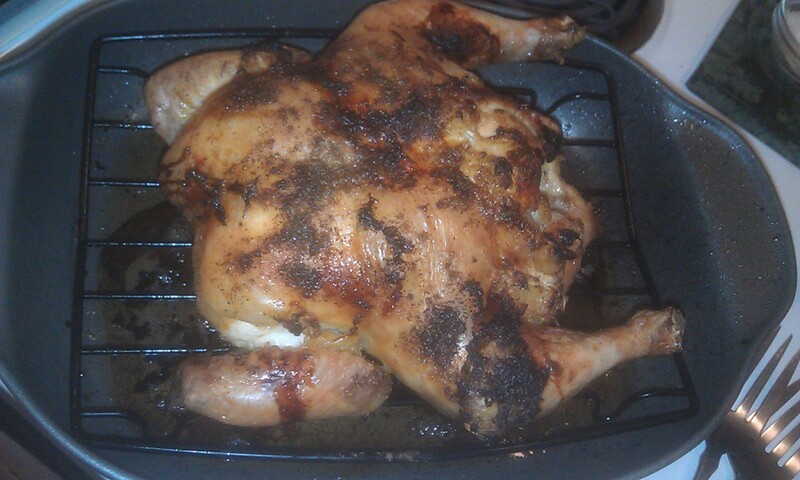 When was the last time you roasted a whole chicken? I don’t do it nearly as often as I’d like, usually favoring quick preparations with cut-up chicken parts, especially thighs. (Don’t talk to me about boneless, skinless breasts, the bane of my life.) But the mouthwatering photo in the December 16 New York Times Magazine article, “Feast in a Day,” was irresistible. First, over the holidays, I made the almond cake that was the coda to the dinner, there’s a photo of that in my Holiday Gallery post. That was so good, I made it again for a Chinese New Year dinner hosted by Angela and Humphrey Chang. But, with that chicken on my mind, and a coupon for a free chicken at Whole Foods, I decided it was time to make use of a bottle of preserved lemons sitting in my cupboard. This is the result here, it was easy to do, no trussing required, and the results…well, fabulous. I prepared some couscous (Pereg whole wheat with mushrooms) to go with this, and had a simple salad on the side, and there you go, Sunday dinner.